My husband Tim has a colleague who lives in Tunbridge Wells and he recommended Kitsu to us some time ago. Due to a really busy year it is only now we head into August we’ve had a chance to visit. Kitsu is another restaurant that very much focusses on its food; the décor is simple and unassuming, only about ten tables in the small restaurant, it was full when we visited for Friday lunch. I was happy to see that my favourite Japanese drink ramune was on the menu, although I got some strange looks while opening it from the guy on the table next to ours as I forced the marble through the bottle to get to the drink. I was amazed by the vast selection of the menu. Where on earth to even start choosing what to order? I knew by reading reviews online that their sushi was one of the highlights, so I knew I had to order at least a little to try. I am ashamed to say I have never had sushi apart from the supermarket, which I now realise is nothing like the real thing! Kitsu have two lunchtime deals, running Monday to Friday, one to choose from a selection of sushi and the other for a starter, including a choice of sushi, and a main for a set price. 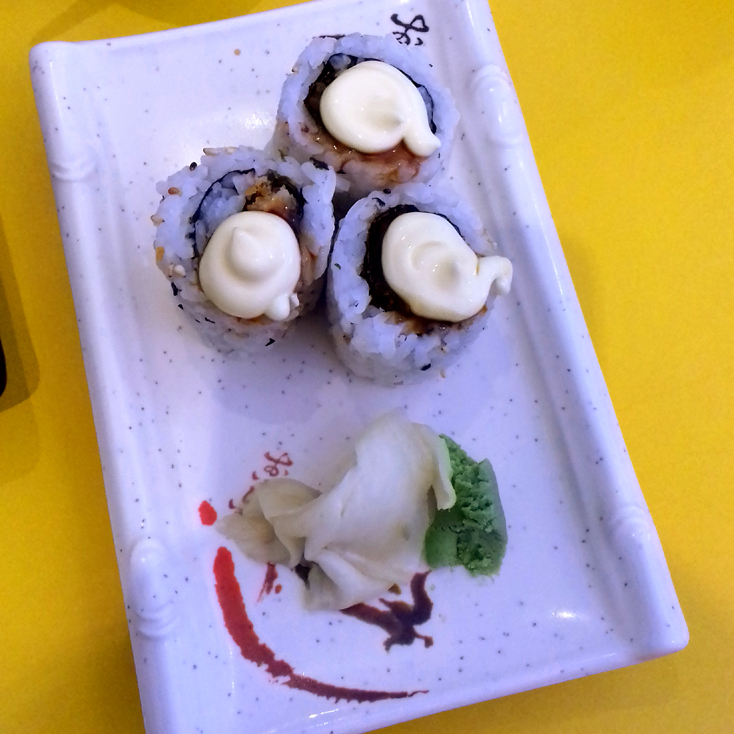 This seemed a good idea as it gave us a chance to try some sushi as well as a choice of noodle or rice dishes, such as ramen and stir fried noodles. I chose the chicken katsu UM maki rolls to start and Tim chose ebi tempura. It was a very warm, muggy day after a week of rain and I didn’t really fancy a steaming bowl of broth, so I opted for chicken yaki udon and Tim chose chilli seafood ramen, which I was pleased about as it meant I got to try their ramen too! We had also spied one of our favourite dishes on the main menu, spicy salt and pepper squid, which we ordered as well. Our starters and side dish came out very quickly and looked amazing. The sushi came with a blob of wasabi and some pickled ginger on the side and was so far beyond sushi I have eaten before. I really hadn’t fancied the idea of a whole meal of sushi but I am definitely going to do this next time I’m in Tunbridge Wells! Tim’s king prawns were so good as well, with a light tempura batter and a sweet and sour dipping sauce. 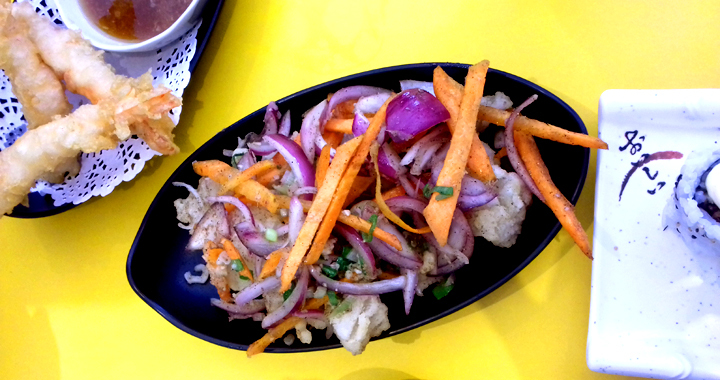 I think the squid is possibly the nicest version of this dish I’ve had- nice big bits of squid in a light batter with a salt and pepper seasoning, mixed with carrots, red onion and spring onion. Our mains then came out- my yaki udon looked great, I do love udon noodles for their thicker size and texture. 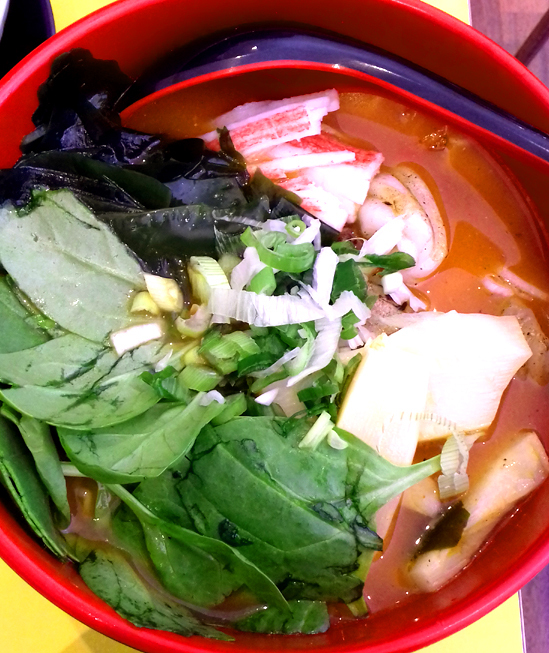 Tim’s ramen also looked really good, with mixed seafood- prawn, squid and crabsticks in a bright orangey-red broth, with bamboo shoots and spinach. 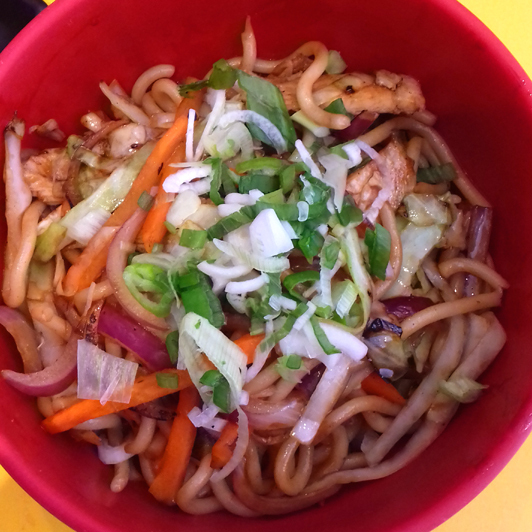 The yaki udon tasted amazing- simple flavours but with a smokiness from being wok fried. Plenty of cabbage and red onion for flavour too. Tim’s ramen was also really tasty- I think he was a bit disappointed it wasn’t a really rich seafood broth but with a tiny kitchen and a big menu of sushi as well as other Japanese dishes, I wouldn’t expect them to make individual stocks for each ramen. To me it was spicy and flavourful and the toppings, especially the bamboo shoots which I’ve never had in such large pieces before, made a really great bowl of ramen. We would have loved to have ordered more. As more food came out for people at the other tables, everything looked so appetising. Unfortunately after eating everything in front of us, we were really full so couldn’t squeeze anything else in, even though they had some really interesting sounding flavours of ice cream and sorbet, like sesame, matcha and lychee. I also noticed too late takoyaki on the specials board- my sister’s favourite Japanese dish that has become of my favourite dishes too. Next time!!! 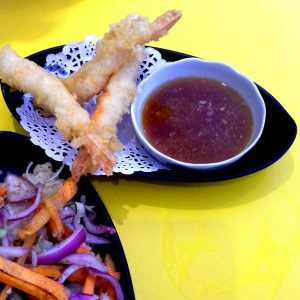 Overall, I was really impressed with the service and quality of the food in this little Japanese restaurant tucked away in a corner of Tunbridge Wells. That it is down a little side street away from the main high street and still so busy speaks volumes for how well loved the food is. This is definitely going to become a favourite haunt every time I am shopping in Tunbridge Wells, especially as they do takeaway as well. 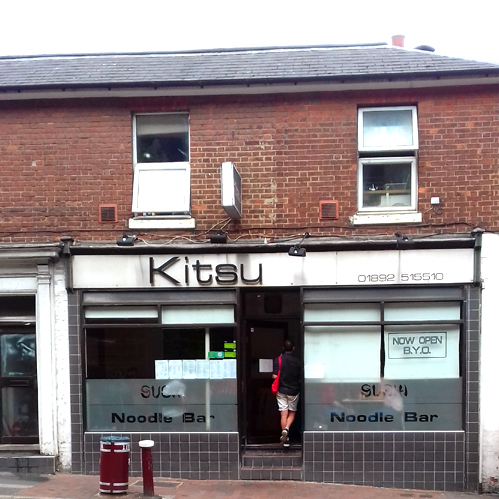 Posted in Restaurant Reviews, Reviews, Uncategorised and tagged Ramen, Restaurant, Review, Sushi, Tunbridge Wells.